OH MY GOD I CAN’T STOP YELLING. Tiger Woods is currently two shots back from the lead at the PGA Championship at Bellerive Country Club. His tee shot on the third hole rolled up to the edge of a water hazard, but he had no problems recovering from the bank and put this one to five feet. It was a damn gem. After missing an eight foot birdie putt on the opening hole, Tiger cleaned that one up easily from four feet. At the third hole, he was even closer, igniting what has been the most crowded venue we’ve seen at a major. This ballmark is some six inches from the cup and resulted in an easy tap-in birdie that would put him in solo second behind Brooks Koepka. Tiger is obviously dialed in with his irons right now. He has been all week, and really all season. 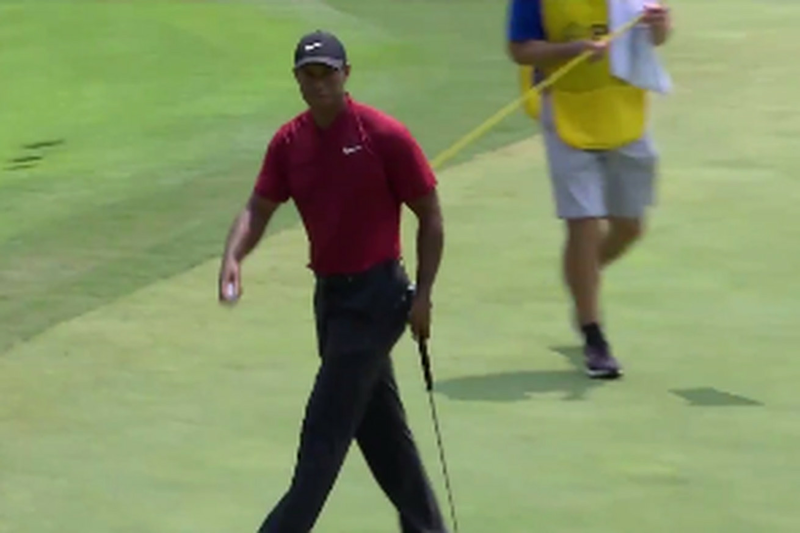 It’s what has made him so competitive, so fast and that distance control skill is especially useful when the course is so soft like this You can throw darts into the flags and Tiger is doing just that on Sunday. Woods, who shot a 66 on Friday and Saturday, has been absolutely phenomenal on the front nine all week. He’s now 12-under on the front nine to an ugly 2-over on the back nine. Koepka has looked like a machine so far this week so he’ll need to keep the pedal down the entire 18 to even have a chance. Sundays are so much more fun when Tiger is doing stuff like this, man, The rest of the day should be a treat to watch.